A beautiful sunset washed the sky with the prettiest pastel colors as I was driving home from work the other night. A soft shade of lavender swirled around hues of pink and pale blue. Behind it all was the glow of the sun and it was mesmerizing. The artistry in the sky inspired me to write a post about decorating with lavender. Lavender isn’t typically the first shade of paint chosen for a living room, but its effect can be serene and calming. The addition of wood furniture creates an elegant space. For a more dramatic look, darken the shade of lavender and choose a soft plum. The end result is a bit more sophisticated. Ultra Violet is the Pantone 2018 Color of the Year and while plum isn’t quite as saturated, it comes close. Most people wouldn’t think to use lavender with a farmhouse style living room, but the effect is quite peaceful when used on trim work. 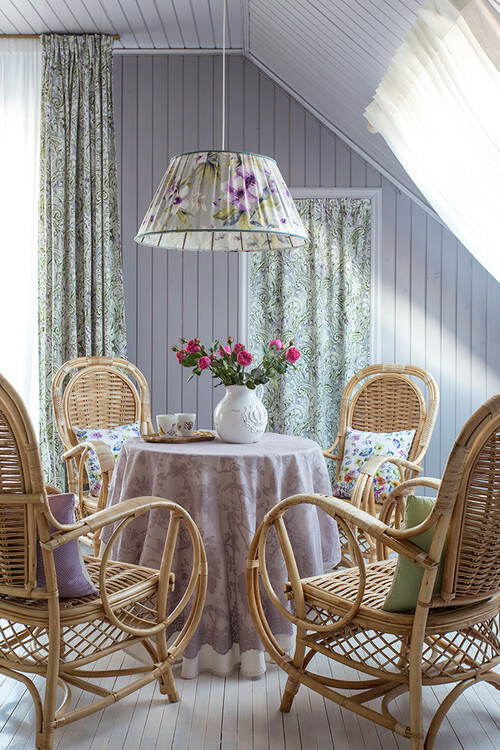 Create a cottage style dining room worthy of shabby chic appeal by painting walls a lavender-gray tone. You’ll find many shades of gray have an underlying lavender or violet tone to them. Of course, decorating with lavender can create a more elegant dining experience, too. I’m a huge fan of pairing lavender with gray and this inspirational photo is probably my favorite in showcasing ideas for decorating with lavender. Puppy looks content with his homeowner’s design choices. Lavender in the kitchen? Why not? 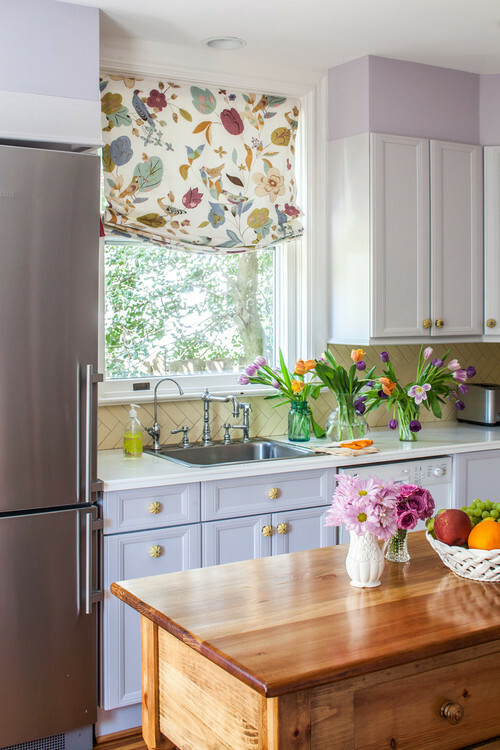 If you’re looking for something different, add a single piece of lavender in the room, like your kitchen island. 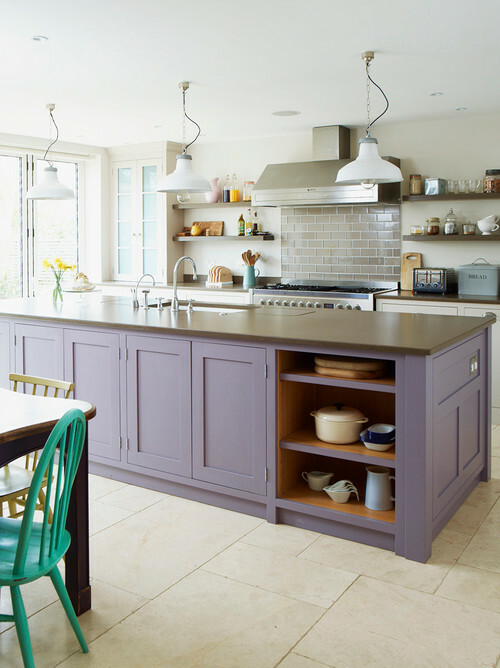 This kitchen features a grayish shade of lavender on the ceiling and the cabinets below. 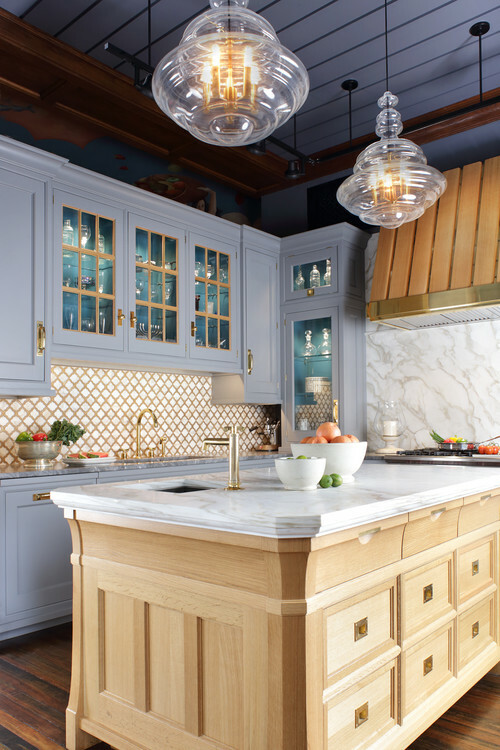 A light wood range hood and kitchen island balance the color to create a pleasing effect. 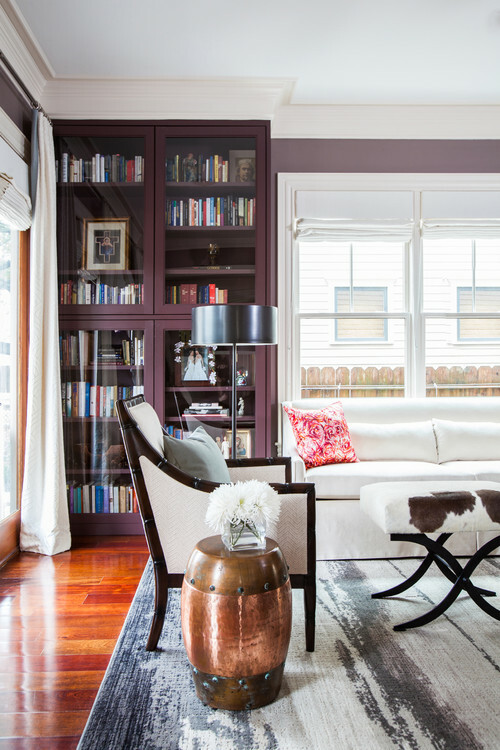 Try experimenting with a pale shade of lavender on the walls instead of your basic white. It’ll give your kitchen a special glow. 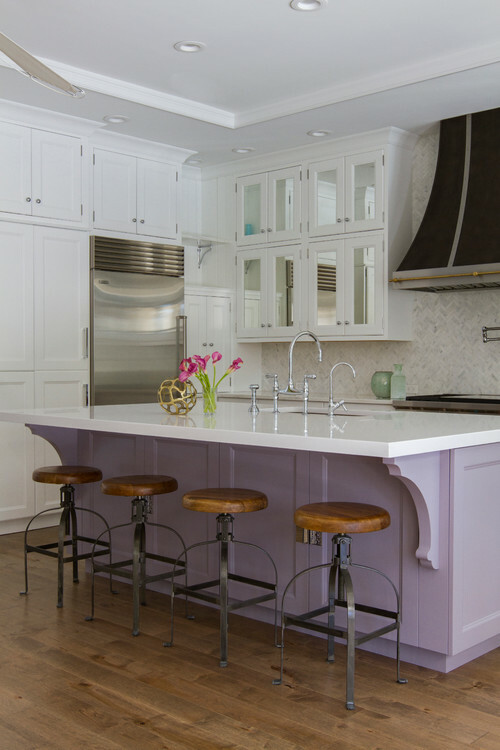 Bold colors pair well with lavender, as seen with the bright aqua chair against the lavender island in this unique kitchen. Most people would choose a bedroom when decorating with lavender. If you’re afraid to commit to wall paint in this pretty hue, consider adding lavender bedding as a seasonal option for spring or summer. You’ll find your bedroom can be quite serene and restful. 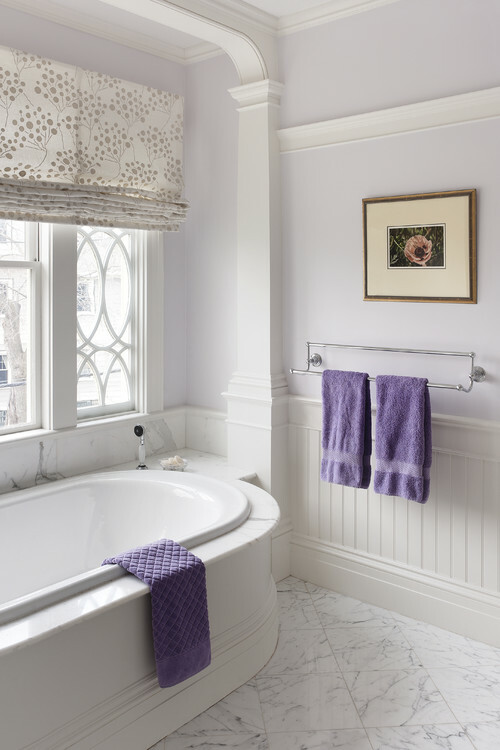 Normally I wouldn’t choose lavender for a bathroom, but I have to admit I really love this space! 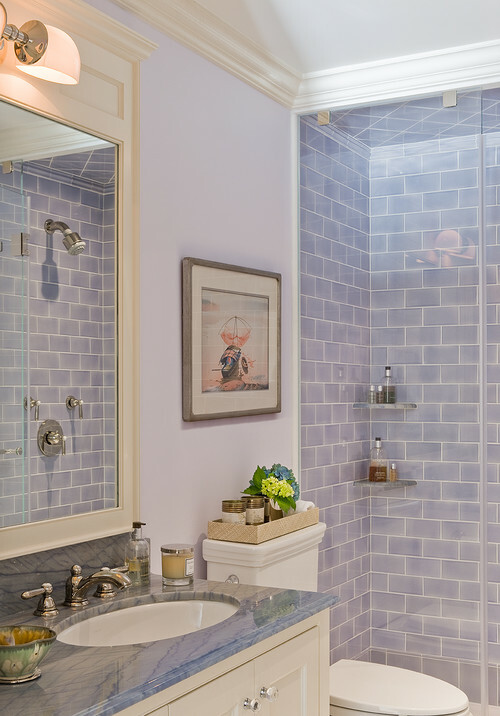 If you’re braver than most people, opt for lavender tiles in your bathroom. 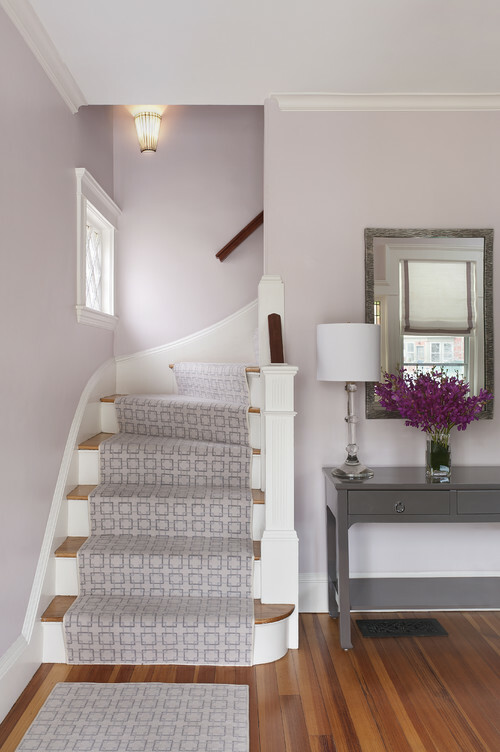 Lavender in the foyer creates a soft and welcoming entry to your home. Keep it from looking too sweet by adding a contemporary stair runner and gray accent pieces. 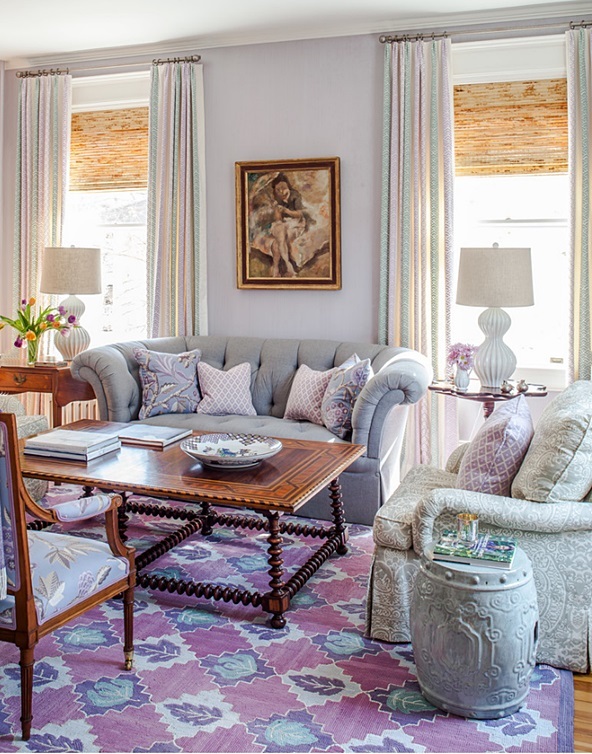 When I think of decorating with lavender, I typically envision a Victorian style house. 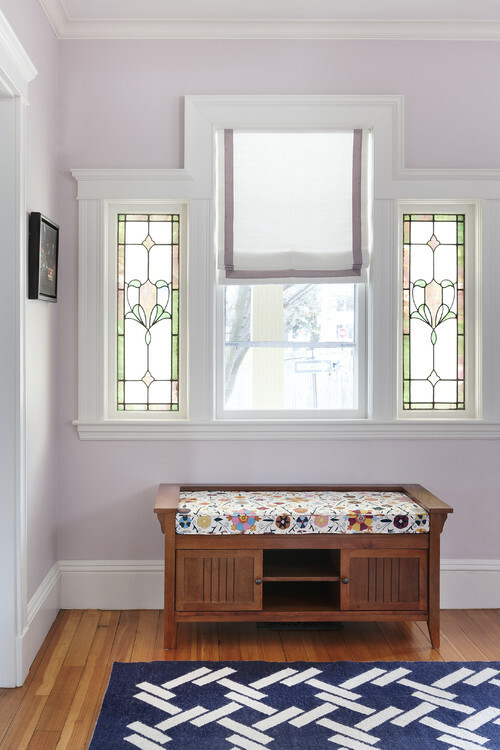 Something like this foyer with its stained glass windows and architectural details. Do you have any lavender in your home? If not, consider adding a couple of throw pillows in this lovely shade that appears in romantic sunsets! Lavender is one of those colors I change my mind on. I either love it or not. So I would never commit to anything like lavender tile or paint, but would take it in small accent pieces. Now that I grow lavender and enjoy the scent so much, I seem to like the color more. I think because I have such a pleasant association with the scent, I like the color more, if that makes any sense. I went shopping and they had a sheet sale, i bought me some lavender sheets and need to find me the perfect material to make throw pillows for my bed. They were such a pretty color and i needed a change and it’s so easy to make throw pillows and cushions for my bedroom. I loved the kitchens the most, an island would be easy to change, but no tile. Thanks Jennifer. A little lavender goes a long way with me. However, the photo Molly Ray Young took of the dinning room is absolutely breath taking. My daughter wanted a lavender bedroom, I think we got the color a little to deep, it took two coats of kiltz to cover. But my daughter loved it. I was at Home Goods Monday and saw some beautiful light lavender linen pillows. I almost got them, but decided I have too many pillows, So I Left them. Now i wish I had gotten them. It is a Long Drive to Go back. I Will Check My TJ Maxx, Maybe they have Some! Loved this post! I absolutely love lavender and gray together. I’ve been trying to choose a new color for the walls of my master bath (connected to my gray bedroom) and this post has renewed my interest in finding a shade of lavender (probably not too light) that I would be happy using in there. I recently removed an over-the-toilet standing shelf unit that has been there for 15 years and a builder’s flat unframed mirror over the vanity and both left holes in the wall where anchored. Obviously repairs are needed so it’s a good time to go with a new color. Thanks for reminding me that lavenders/purples/plums can be an option for just about any room in the house. By the way, my favorite room in your post is the little cottage style shabby chic dining area. So cute. When I was a young lady … everything I had was some shade of lavender. My bedroom had the most beautiful purple bed covers and the most stunning shade of lavender drapes and even my white sheets had small purple flowers all over them. The rug on the floor was a wonderful mix of purple and greens and yellows. I owned the most amazing purple corduroy winter coat with a lovely hat, scarf and matching mittens made by my grandma. I even had matching purple cords (pants) I felt like I was dressed to the nines whenever I went out … I still enjoy all the wonderful shades of lavender and make a point of using that color somewhere in my home.